Ironmen Park was built in 1954. The Ironmen had been playing in a diamond that had been located in the center portion of the Miramichi Agriculture Exhibition Association race track. This field, however, was hardly in the best of condition and the ball playing sometimes disturbed the horses and made them restless. Through efforts of men like Ben O’Reilly, Joe Cook, Joseph Currie, Ray Pyne and Mayor D.J. Cripps, steps were taken to have a park constructed where it is today. Baseball is a game of statistics, maybe even more so than most other games. It is said that it is the thinking man’s game and probably has more easy-chair quarterbacks (excuse the mixing of metaphors) than any other sport. But beyond all the stats, are the intangibles that make baseball the game that so many love. One of these is found in Miramichi. It is Ironmen Field, home of the Chatham Ironmen. A couple of factors in particular make Ironmen Field the Miramichi baseball tradition that it is. They are the park itself and the fans. First Ironmen Field is like a strong cup of tea that is steeped in tradition, a tradition of winning. Ironmen Field was built in 1953. Until the 1930s the Ironmen played first on a ball field associated with St. Thomas College. From there the team moved to the Exhibition Race Track grounds. In 1953 the Ironmen leased land from the Sisters at the Hotel Dieu Hospital and Ironmen Field became a reality. Chatham councilor Ben O’Reilly was one who helped to get the park started. He also operated the canteen. Another who helped was Mr. Ironmen himself, Joe Cook. Cook started coaching in the early 1940s and took over the Ironmen reins from Willy Jardine in 1949. He also coached the provincial midget championship team in 1957 when Greg Morris was team captain. Cook and a host of volunteers helped build the park. Cook used to prepare the grounds for game time, using his own lawn mower to cut the grass in the outfield. In the early days, the center field fence measured 425 feet from home plate. Don Martin hit the first home run over right field. 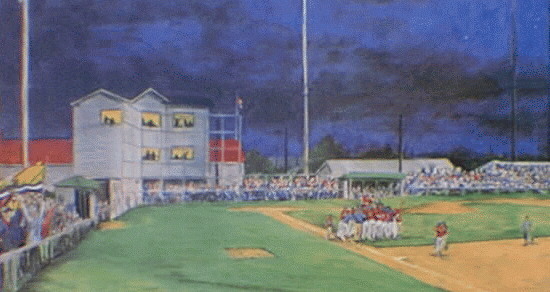 Later, Ironmen Field was equipped with lights making night time baseball a reality. In 1995 it was given a reconditioning for the 1995 Nationals being hosted by the Ironmen. It now has a three-story clubhouse, ticket booth and canteen. It has a manicured infield with the green grass melding nicely with the green outfield wall. The first level houses the canteen, ticket booth and washrooms. The second level has the visitor’s and umpire changing rooms and press box where John Cripps announces batters, plays the music, thanks sponsors, calls out program draws and advertises “Piping Hot Pizza” while Donald Clancy keeps the stats. The third floor houses the Ironmen Club Room painted the Ironmen colours of red, white and blue, and a private viewing room for club officials and long time Ironmen like Joe Cook, Tom MacLean and George Lloyd. It also has a common room and viewing area for the Ironmen with the wall decorated by photos of winning Ironmen teams and the news clipping of Jason Dickson’s first major league game. Throughout the park you will find Darlene O’Donnell and Agnes O’Neill scurrying about selling 50/50 tickets, programs and checking with Ironmen GM Daryl Matthews to see what else needs to be done. Linda Morris will be watching the canteen and generally helping out with whatever needs to be done. Ron “Bearcat” McCormack will be kept busy checking equipment and making sure everything is game ready. Mike Hale will be selling programs and then retrieving baseballs with Allan Sutherland. This is Ironmen Park on baseball night. It would take a good statistician to accurately record the number of teams from minor ball right through to senior, that have won provincial, Atlantic and national titles within its fences. The Senior Ironmen alone have won provincial titles in 1967, 74, 75, 76, 78, 81 and 98 along with a Senior National Championship in 1995. They added a bronze medal when they again hosted the National Senior Championship in 1999. Ironmen Field itself is a small Boston Fenway Park with its own Green Monster down the left field line. Right handed batters drool when they enter the park and see the short fence, particularly if it is their first time there. The Wall rises some 16 feet down the line which measures only 300 feet from home plate and stretches almost to center field. Like Fenway’s Green Monster, it too is green, topped with a net to catch balls which may exit over the minor ball field adjacent. The center field alley is 385 feet while the right field line is 315 feet. Not only does the Mini-Green Monster entice batters, but it is the source of hope for the hometown Ironmen fans. Sure, it is criticized by opposition visitors as not being a legitimate fence and that home runs are cheap, especially with a good wind blowing out. But the bottom line is both teams play the same number of innings with it. But beyond that fact lies the intangible. Fans never go home early for they know that the Ironmen will bat last and with their precious Mini-Monster, hope springs eternal. There is always the last gasp, and stats will bear this out as the Ironmen have rallied for late and last inning heroics. And the fans go home happy–and they come back, bitten with the bug of the home team winning. And it worries the opponents who must play with this Mini-Monster at their backs, knowing a routine fly ball will send the bleachers into a volley of cheers and hand raising as the last Ironmen crosses the plate. It has been said that baseball is a “field of dreams” and perhaps no more so than in Ironmen Park. It is small and intimate and full of hope. Witness the fact that Jason Dickson played there like many others and he dared to dream, and followed that dream straight to the American League All-Star Game. Then there are the fans, the other intangible. What would a game at Ironmen Park be without Ivan King hollering “swing” as he needles umpires and opponents much to the delight of everyone there. And there is Alpine Alley (enough said), along with “Coaches Corner” along the third-base line where the opposition is verbally put in place if they happen to respond to any comment. At the 1995 Canadian National tournament crowds of 3,000 packed the park. Baseball is serious business here. The fans themselves are very knowledgeable. They are positioned extremely close to the playing field which brings intimacy to the game. They are there and very much a part of the action and both teams know it, especially the opposition. What other minor league ball park would have a special series of hand painted numbered prints made of it and sold to those fans, players and coaches who have spent some of their best times there. This is Ironmen Park. And in the minds of its fans, it is the place referred to when someone sings “Take me out to the ball game, Take in the crowd….and it’s root, root, root for the home team, If they don’t win it’s a shame.” And the fans and players believe this. It is a shame not to win. That is why the Ironmen have the winning tradition that they do. Perhaps when the line-up cards are presented to the umpires, Ironmen Park and its fans should be added to the list.